Ski, Hike, Golf, Sail, Dine, Ride, Relax. It all starts here, right in the heart of Tahoe Donner. Nestled in the pine trees, this beautiful house has everything you need, and all the extras that make your stay in the mountains memorable. Kids friendly amenities make your vacation with children easier and joyful. New whole house force-air heating system keeps you comfy and warm. House has a level driveway (easier to get in and out in winter). When you enter the house, you will find spectacular vaulted ceilings and a gorgeous thermostat-controlled fireplace. Abundant sunlight shine through the large windows. There is a large dining table in the dining room. A large deck off the dining room for you to enjoy the forest views. Kitchen is fully stocked for you to prepare delicious meals for family and friends. We know a good night’s sleep is essential to your family (like ours). That is why we furnished our bedrooms with Simmons Beautyrest mattresses from Macys and mattress pads for additional comfort and protection. New Kenmore washer and dryer, new refrigerator. Newly remodeled bathrooms. Extra soft blankets and extra soft towels. Everything that matters to us, we have it for you to enjoy. Loads of toys for you and your little ones to enjoy. Whether you want to build a lego city, a railway, or, simply make cheerful music, you can find it upstairs in the play area. Our stay at the Donner home was amazing! We loved the flow of this place (with open loft and the main living space downstairs also very open)! The check in and check out instructions were very easy and we didn’t have to pick up a key (just used the box on the door to get in and out). The only thing that was missing was instructions about where to put the garbage, and there were no additional garbage bags (we brought our own) or additional toilet paper rolls (we bought some). We would have liked to be able to connect to WiFi as well (other than through our phones). But it really was a beautiful place and felt like being at home in the snow. Thank you so much for allowing our family to stay in your cozy Donner home! This was a great place to stay for a few days and connect with friends and family. Super close to many ski/snowboard options, and skating in Truckee. The high ceilings, nice floors, and furnishings overall were pretty comfortable for ten people. I agree with earlier reviews about the odd aspects of what seems to be a nice update/remodel-in-progress (e.g. covered light switches), but everything we needed worked well (laundry, thermostat, fireplace, vacuum cleaner). Somewhere in the entry to hang wet snow jackets and stand wet boots (coat rack/shoe rack). I worried about the new wood floors but we managed. A floor mat for each of the bathrooms and a second floor mat for the entry - we made do with towels as best we could. We did find someone else's left-behind clothing under one bed, so the cleaning service in between could have maybe been a bit more thorough. 2 living room futons that can fold out for one or two people to sleep on. It worked out fine for our group of easygoing kids and parents. The toys mentioned in other reviews are generally for smaller kids age 1-5. Oh, and the heat goes to the whole house and the thermostat is in the open living room, so when you close the bedroom doors the bedrooms can get quite a bit warmer than the rest of the place. Easy fix: keep thermostat lower and supplement with fireplace, or close heating vents in bedrooms during the night. Worked out fine. Thanks to the owners for a lovely place to stay! We had a great time and the kids had a blast sledding on the hill out back. The house was comfortable yet needed some additional work. Good was lots of toys for kids, comfortable beds and clean. Needs improvement was: The windows were foggy, light switches covered by tape, not enough built in lighting, dirty cleaning rags left in house, front porch not swept, very small coffee pot. Thank you for sharing your winter wonderland with us! 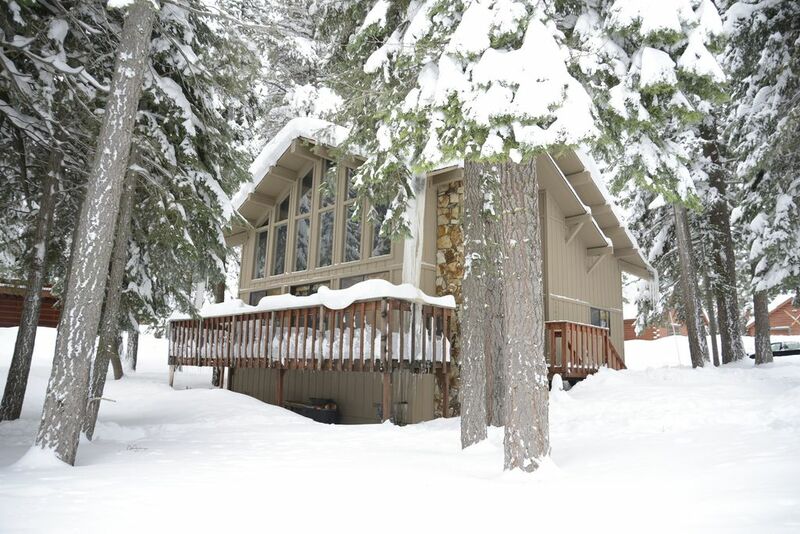 The cabin is in the Tahoe Donner community. Ski resorts like boreal and the Tahoe Donner downhill ski area are a short drive. Our young kids thoroughly enjoyed the ski lessons and snow play. Safeway and other amenities located in short driving distance. The cabin itself was cozy, good heating and flooring. Several beds, linens and bath towels. It accommodated our two families very well. The kitchen had enough plates and utensils. Appliances worked well. Kids had lots of toys and books to keep them engaged. Thanks for sharing. The cabin didn't have wifi or cable Tv. However the area had good cellphone network coverage. We didn't miss it. Netflix worked just fine. We booked this cabin last winter. When we arrived, we found rat droppings in the kitchen and did not stay there. The owner was difficult to deal with and wouldn't have the place cleaned, saying the droppings we saw were from ants the previous summer. By the way, the furnishings are cheap and half the light switches were taped off so you couldn't use them. As a result, the place was very dark. This might not be a problem in the summer, but in the winter, the place was very dark. Would definitely stay here again. It was warm, located really close to Sugar Bowl and Northstar, and can sleep 10 *easily* (lots of bunks). There's no WiFi which is either a big plus or not a big deal if you are ok tethering for a weekend. Tahoe Donner HOA activities include two wonderful centers with pool, gym, outdoor playgrounds, a bocce ball court, yoga classes, downhill and cross country ski resort, a private marina beach on Donner Lake, watercraft for rental and classes, golf course, trails, sledding hills, day camp, bingo, family movie nights, archery, sauna and hot tubs.